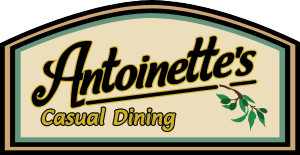 Owners Shaun and Kim Thome invite you to Antoinette’s Casual Dining in historic downtown Plymouth Wisconsin. Located in a former Ford dealership and garage that was built in 1929, Antoinette’s features a broad array of casual dining fare. Homemade appetizers including hand rolled mozzarella sticks and Antoinette’s Signature Spiral Chips. Enjoy fresh salads, sandwiches, wraps and juicy Certified Angus Beef burgers. Antoinette’s homemade pizzas and build your own pastas are sure to please any palate. Antoinette’s also serves Plymouth’s (and possibly the county’s) Best Broasted Chicken. Stop in for a quick lunch, birthday meal, date night or just because...we know you will love it.